Actually, I’m not sure whether this is intended to be a cosplay of Ayanami Rei or Ikari Yui. You see, Rei is only a human vessel, something created in order to contain a soul. She was created by Gendo who had lots his wife during a test experiment on an Eva Unit. Yui disappeared, and it is said her soul resides in Eva. With such a hair color, this cosplayer appears to be more like Yui than Rei, but I don’t recall Yui wearing a plug suit, so I think Rei would be more suitable. 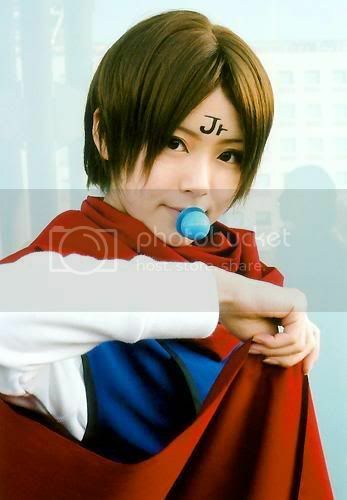 Beautiful cosplay! King Enma Jr., who is more commonly referred to as Koenma, is the son of the ruler of Heaven. He is at least 700 years old, and carries a pacifier that gathers his pure Reiki or spirit energy. When released, the energy acts as a powerful seal to contain dangerous demons. Although he has an adult form, Koenma commented that he prefers to move around in his baby form. Maybe it’s because of his weapon? I mean, he’s be laughed at for having a pacifier at this age, right? Not that it makes him any less cute. Anyway, impressive cosplay. I really miss watching this series too. Great work! One of the most formidable reapers in game, Koki, who is better known as “Lollipop” is a lid-back Reaper who enjoys being out and about in Shibuya. He even turned down his promotion to become an officer because he feels that looking important all day is a boring life. 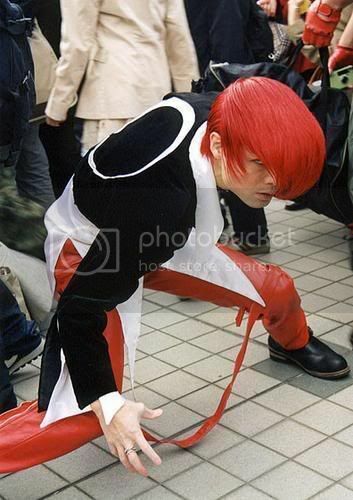 Pretty impressive cosplaying, even though he’s not holding a lollipop. Did you know that in the official TWEWY manga, they revealed that what most people think is a lollipop is actually bean paste on a stick? Fans are a little confused with this because Square Enix’s website had a Reaper Quiz that mentions bean paste is Kariya’s favorite lollipop flavor. Either way, he’s still one of the most awesome characters in the game. Nice cosplaying to boot! You are currently browsing the Nanao’s Cosplay Research weblog archives for May, 2009.